Hi I’m Moda Designer Pat Sloan and I’m EXCITED share some ‘Ruler Talk’ with you. When I was contacted by Sullivan’s USA and asked if I’d be interested in working on a revolutionary new ruler .. well I said “YES”! That started a lively year of designing and product testing that resulted in a ruler that is a game changer. The right side of the ruler has a sharpener embedded in the edge. Every time you use the ruler you ‘sharpen’ your blade, just like when you use a knife sharpener. My part in the process was to develop the unique grid system. I asked for 3 colors on my ruler (yeah!). The red are always ‘half way’ 1.5, 2.5, 3.5, 4.5….. The white are the 1/8″.. well you know what those are! You will ‘Tuck’ your block into the corner. Here I’m working on a 3.5″ square. Once you have it tucked in, not under but next to, the red line, you can trim to a perfect 3.5″ square! Below are three videos I made sharing all the features and sizes the ruler comes in. Ask your favorite quilt shop to contact United Notions to order Sullivan’s Cutting Edge rulers for you! 2- The quilt behind Pat is her pattern called “Stitched”. Ask your favorite store to order it! “I will be giving away one of my rulers to one lucky winner! To enter please leave a comment with why you would like to try out this ruler. Previous Previous post: How Do You Measure Up? I love the look of the rulers and what a bonus if you can sharpen your blade at the same time. I will watch for these at my LQS. I wonder if they do a left-hand version? Nice quilt in the picture. Can you give me the name of the pattern? I have seen these rulers on line but not in any stores and didn’t know anyone who had one – I wondered if they really worked. Interesting! What a great idea!! thank you for the 3 color markings, especially the white 1/8″ marks — phew, no more guessing! and I love your square-up rulers. Looks awesome! What a great idea. Great markings on that ruler. I like the different color lines for different increments. I am lazy with changing blades…this would really help with my cutting! I love the three color system. I think that might help to “look” at the right line! This is quite the ruler. It sharpens your blade while you are cutting. Just awesome. Gotta win. Gotta have it. Thanks for the chance to win. Every quilter will definitely want this ruler. Quite unique. Definitely. I never seem to have extra rotary blades when I need them. The idea behind this ruler is brilliant! It would be great to not wear out the blade so often. I want to try this ruler. I would love to have this ruler. Sharpen blades as we cut is awesome. Sharpen as you go is a brilliant idea Pat! Your three colors will make things much easy for those of us with older eyes! Thanks for the give away! Sharpening the rotary blades has always been a problem for me. I always seem to let them go to lng. This is aboon to guilting. I really want one! Love that ‘tuck in’ feature on the square up ruler! I’ve been wondering about these rulers, and since my old ones need replacing shortly, will be looking at these, for sure! My cutting abilities would be greatly improved if I owned this new ruler! Love this idea and it would be so nice to have a sharp blade. Gives “Measure twice and cut once” a whole new meaning. Thanks for all the thoughtful markings. I would love to own one. I do so much cutting and the idea of a ruler that sharpens my blade, awesome!! Would love to try these out!! Hi,this new ruler sounds great! I’d love the sharpening feature! Thanks for sharing! I would love to try this new ruler because of the ease in finding the 1/2, 1/4, and 1/8 inch markings! I find that clever! I like the fact that the ruler is clear, as well. Finally, distinct markings in colors! I cant wait and will definitely start looking for these in the stores. This would be a ruler I would use a lot. Love the idea of sharpening the blade as you use it. Thanks for sharing. Would love to win as I tend to use my blade until it no longer cuts without lots of skipped places. This ruler looks like something I’d like to try – I really like the three color grid, and saving money by not buying new blades all the time would be a real plus. I should like to get one ruler because I can save on the blade! The colored markings on your rulers is a great idea…I would love to try one…I am all for anything to make cutting easier! And the bonus is you are getting your blade sharpened at the same time. What’s not to like? That ruler sounds great with the sharpener on it, thanks for the chance. I’d love to try out this ruler. A sharpener on the edge–how cool is that? Love the coloured lines too! I love the idea of the built in sharpener and also for some reason i tend to slice of the corners of my rulers with the blades and I think this edging will stop that. Very interesting and a great new tool. As I’m getting older and so are the eyes, the new red line would be very helpful. Would very much like to try this. I love the different colors ~ that would make me make less errors ~ and the love the part of sharpening my rotary cutter as I work ~ Win…Win….Situation! I would love to try these! I’m always replacing dull blades and that costs a fortune! A ruler that sharpens my blade? Yes, please! I’d love to get one of these for my mother who goes through blades really quickly as she doesn’t have a lot strength and needs very sharp blades all the time. This ruler could be a life safer for her (not to mention a money saver!). Love those red lines too. Wonderful. I’d like to try the rulers because my blades seem to get dull so quickly and leave ‘holidays’ where they don’t cut. And the red lines look like a wonderful idea!!! I would love to try out this ruler !!! I am a rulerholic love to try new and old rulers out! You never know what is going to work for you! LOL!!! What an awesome ruler!! I have been thinking about getting a blade sharpener. This ruler would be fantastic because it would mean I wouldn’t have to drag out the sharpener. I could be sharpening every time I cut. That is just fabulous! Thanks for the chance to win one. These are the absolute best rulers. I use mine all the time and would really like to have another size. Thank you Pat and Sullivan and Moda. I love the 3 color lines and the fact that I can sharpen my blade at the same time!! I need these rulers!! For years I’ve been looking for just the right ruler. I have dozens. This one looks as close to perfect as possible and I’ll definitely try it. Oh how I’d love to get rid of some of these rulers! i really like these rulers, everything is easy to see, (older eyes need more help lol). the red lines are a great idea. OMG — it is so about time. I save my “old” dull rotary blades to use on paper — now it seems, I always have at least 10 paper blades and lucky if I have an extra blade to make it through my latest project. Would SOOOO love to have this ruler!! That sounds like a great ruler to have. I can save money on new blades. These rulers are brilliant ! Great markings and love the the sharpener edge. I’d love to try this ruler because I’ve never seen one before!! What a great idea. Why didn’t I think of that! Rotary blades are expensive so I’d love to try anything that makes them last longer. Lovin’ the fact that this ruler sharpens my rotary cutter blade, and those 1/8″ ruler marks – wow! I love this idea! Perfect for squaring up half square triangles. I have admired Pat Sloan for a long time, and I would love to try out a product she recommends. Sharpening the blade while you cut is a wonderful concept. I totally need sharper blades. I’d love to try. Thanks for the chance. Oh this is a GREAT idea for a ruler. I have to have one for so many reasons. I tend to wear out my rotary cutters so fast, I have even dropped one right after I replaced the blade and got a knick on it. The cutting lines on the square up are wonderful too!! I’m all about having a sharp blade and I love the different colors on your rulers! Such a smart idea! I would love to try this ruler for pre-cut strips and charms – those little pinked edges drive me crazy when I’m trying to line them up. It looks like this ruler will really help with that! Wonderful idea, I could use this as much as many others. Teaching the offspring to use a rotary cutter is a joy to behold. I would love to try this ruler – I’m a gadget freak! This is the perfect idea~ I can’t believe no one has made a sharpening ruler yet! I’m dealing with Keratoconus, a corneal disease, which mostly causes focus issues and double lines. I need something with bold lines to help me cut accurately. I’m willing to try anything! These rulers look like they would be easy to read with the three colors. Also, the sharpening edge is a great idea. I would love to try the Sullivan’s Edge ruler – what an innovation! I love Pat’s method of ensuring that you’re cutting correctly with the color coded system. Way to go, Pat. If I try this ruler maybe my squares will all be cut to size perfectly plus my cutter will be sharpened in the process. What a bonus! Thank you for the chance to win. What a clever idea! I’d love to try one of those out sometime. Thanks for the chance to win! Great. Idea! Would love to give its try! Great idea! I’d like to try it for potential use (or even sale) in my own shop. Love the idea of sharpening while cutting and the 3 colors of lines is great! Wow, finally a well planned ruler that does “everything”, I love it! This is a wonderful idea–I hate to have to stop and sharpen my rotary blades! I would love to try out this new ruler!! Not only are the markings very visible but my rotary blade gets sharpened with each cut… Awesome!!! Why do I want to try out this ruler? Because I have some very dull blades and if these blades can be sharpened by cutting material then I say WHAHOO!! Yes, this is awesome!!! What a great idea! I’m always running out of blades and having the ability to lengthen the life of a blade would be amazing. Thanks for the chance to win. Well, I am getting older–sigh, and my eyesight isn’t what it used to be. Those red lines should help me with accuracy. Oh my gosh! A dream come true! Thanks for letting us all know about this wonderful ruler. I need one now! Wow, That’s a ruler I could REALLY use! I would love a ruler that aharpens my rotary blade. I like the idea of putting the line next to the fabric as that is my tendancy anyway. This ruler looks awesome! What a great way to sharpen your blade while you cut and measure! For some one who hates changing blades this is a godsend. Some very practical features. Would love to try it. I like the idea of sharpening the blade while cutting. That is what I like about this ruler. Thanks for the chance to win! I love the idea of three line colors! That will be so much easier on our eyes. Many thanks! Blades are expensive..so is fabric, any ruler that helps me be more precise with my cutting and that helps keep my blade sharp is one that I will use. I’d like to try out this ruler as my sharpeners are not all that satisfactory and I’m hoping this will be better. This is the best invention since the wheel! LOL I am notorious for wearing out my blades since I apparently apply a lot of pressure when I rotary cut! Sometimes I take a bite out my corners. Every ruler I own have nipped corners! I need this ruler!!! I love that it sharpens the rotary cutter blade while you cut and the three color lines. REvoluntionary! I would love to have this ruler. Dull rotary blades cause skipping for me. I try to get the most mileage out of a blade, but it is never enough. Thanks for the chance to win. If this ruler will save blades, count me in. Love the 3 color markings. This would be a fantastic money saver…money to spend on more patterns and fabric! Can’t wait to give it a try! Ohh, who wouldn’t want this ruler! I love how easily and accurately a sharp blade cuts. If this ruler helps keep blades sharp, I want one! Thanks for the giveaway! I would love to try it because I always have trouble seeing where the corner is when I am squaring up my blocks. This looks like it would make that a lot easier! Two reasons: It would be wonderful to always have a sharp blade, and this looks like a great way to square up blocks! Thank you. This ruler has everything I look for and need on a consistent basis! Ah, this ruler would simplify so much! I would love to try this ruler because I can only get my blades from overseas and they cost me a fortune! The sharpening edge is genius! I would love to try one out. I love the idea of the three-color differentiation on the grid. I have been cutting a lot of squares in the /8th end of things, and it can be so confusing to see all of those little lines! (That sounds ridiculous, but it’s true.) Having different colors would keep me oriented and prevent mis-cuts. I always get nicks in my blades and it sounds like your ruler could help that issue. I need one of these rulers—I always procrastinate and wait to change my blade waaaay past it’s cutting life and then I wonder why I tortured myself using such a dull blade! At the rate one could potentially go through rotary blades, I know I would love to have a ruler that could sharpen the blades rather than having to replace as often.I could really save some money. The sharpening aspect is the big draw, but I love the idea of the red lines at the half inch marks. I love how the lines are marked very clearly! Love the idea of the sharpener! Anything to not be buying blades over and over sounds great! I would love to try out this ruler! It looks like it will make squaring up a breeze, and who wouldn’t want to keep their blades sharp? Wow, this is brillianT1 I hate paying for blades all the time, they get expensive! I would love to try out this ruler. The system of lines is very visible, and I am guilty of not replacing my rotary cutter blades often enough. Sharpening while cutting would be wonderful! I love the look of the rulers and what a bonus to have yor blade sharpened each time you use the ruler. A ruler that sharpens your rotary cotter blade is just ingenious! I love the ruler it looks awesome! A ruler with different color lines would be great. Add the bonus of sharpen rotary blades. I would love to have one. It would be awesome to have a ruler that sharpens the blades! I would love to win this. Oh I would love to own this ruler , those lines in different Colors would be so helpful . Thanks for the chance. What a great idea. I kinda feel guilty when I dispose of my dull blades but this ruler would help for sure. This is a brilliant ruler! Great features that would really help with accurate cutting & your rotary cutter stays sharp as well – talk about a win-win! Thanks for the chance to win. I’m terrible at changing my blades often enough – this would help so much! My rotary blade is ALWAYS in motion hence it is ALWAYS dull!! I would love to give this ruler a test drive!! Thanks for the chance! Why? Because this ruler is a win-win ruler. I get accurate squares and sharp blade. Win-Win! I’d love to try out the Sullivans rulers. It looks like they are the best of all situations: good sizes, great markings, easy viewing, sharpens your blade every cut! Well…blades are expensive and since I have gotten back into quilting I found that I am running through blades like water. This looks like the answer. I love the markings on the rulers too. I love that it will sharpen your rotary cutter. Plus it will be so easy to square up blocks. The accuracy will be wonderful! I’m smitten with the tuck it in to cut perfect squares feature. NICE! I have wondered if they really work… Love the three color idea, I considered buying one just for the red….my favorite color!!! Thanks for the chance to win one of these rulers. I would like to win one so I could save money on rotary blades. Love the idea of different colored markings! What’s not to like!? The different colors for the lines is especially useful – in addition to that built-in sharpener. I would love to have several of these. I like the different color markings and the message for the bias line- no more searching for it. I would love to win one of the rulers! Thank you! I think this ruler will be the best of two worlds. I have M.S. and the start of Macular Degeneration, the different colored lines will be a plus for those of us with eye problems and keeping our blades sharp at the same time is truly a great thing. Blades are expensive! Great idea that each color is a different measurement and to have a ruler also sharpen your rotary blade is an added plus. I’ve never seen them before, I’d love to try it. Thank you. I would love to try this kind of ruler. Cutting is not my favorite thing and this looks like it would improve my results. Thanks! Very well thought out to cover so many issues, love the 3 color system and really love the ruler sharpening. Thanks for the opportunity to win. Great concept! Easy to see grid and sharpens your blade when you cut?? I love it! The varied colors are great and a built in sharpener is ingenius. Thanks for the opportunity to participate! I like the look of those rulers. I would love to use one for cutting out my christmas quilts! Thanks for the chance to win! I would love to win a ruler. Like the concept of three different colors at the three increments and the bonus of sharpening the rotary blade as you cut your fabric. What an ingenious design. I’d love to try it. Just think this is awesome. My rotary blade always needs sharpening. I love these rulers I already have several a 61/2 square ruler, 81/2x 41/2 ruler and a 121/2 square ruler as well and they all meet my needs sew perfectly! So therefore I don’t mind if I don’t win! But I wanted to share some comments with you all. It is fantastic ruler and helps with perfect cutting everytime. The sharpening device is also great and sharpens your blade perfectly. It certainly has given me more confidence in cutting by defining the cutting line with the black and red lines. You won’t be making a mistake if you buy any of these rulers. Julie Beard Adelaide Australia. what a brilliant idea! Looks like the numbers & lines are easily visible on a variety of colored fabrics – and all around good product I would say! wow! That looks too good to be true.I need all the help I can get with cutting fabric. I would love to try out this ruler because I use my blades until they’re so dull, I have to cut everything three times to catch all missed spots. I’ve got plenty of spare blades; I’m just to lazy to change them! I have thrown away so many knicked blades, this would be great! I also like the lines on the ruler, easy to see. These rulers look great! I have one of probably every brand out there and they’re all missing “something”. These seem to have it all! Enjoyed the videos but the last two seem to be the same video. Love these new rulers. Love the tuck it in feature, very clear markings,that helps with my accuracy and or course the blade sharpener. I am another one that just leaves that blade in until I am forcing it and I wear down the edges of my favorite rulers and the they are not accurate any more. Yay – another brilliant solution – love the edging on these rulers and the bonus of sharpening. Simply brilliant! Thanks for the chance to win … and I will keep an eye out at my LQS as well! White and black and red marks. Hurray!! Thank-you so much. I hate all my yellow rulers, can’t see the marks. Not that fond of some of my others where the marks are “pale.” I’m old, I don’t see well. The sharpen part is an added bonus. Oh yes that frosted stuff is just a pain to see through in my book. what a great way to extend the life of the blades. I hate cutting with a dull blade and this would really help!!! I would love to try this ruler to make cutting easier! I’ve heard of these, and even seen some in a quilt shop not long ago. It’s a REALLY great idea, and I’ve love the chance to win one. Thanks so much for the opportunity!! Hoping I win one to try. I’d love to win one. That way I could try it for free. Great ruler. I love the bold markings and now the rotary cutter remains sharp also! I love the dark red line. It would really stand out against the fabric below. OH…I have two of the rulers but don’t have a square. I want a square as I love the red lines for squaring up. Hope I win one. The color grid system is great. The large yard stick ruler is a dream come true. 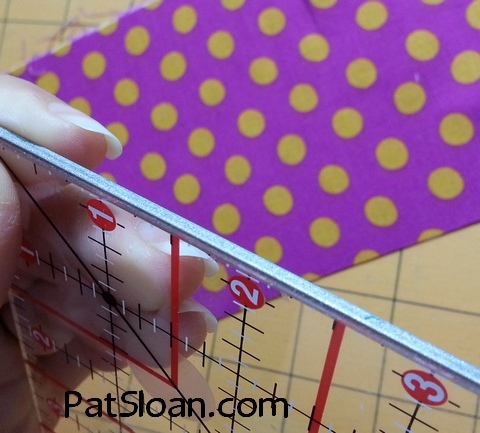 thank you Sullivan’s and Pat for bringing this ruler to quilters everywhere. These rulers are the bomb. As having to replace blades, any quilter would love to have one of these rulers. Just imagine using all the rulers how long your blade would last. Thanks for the opportunity to win. The mats are great as well. Love the markings on each side. Love your radio show and it always makes me want to check out your site and all people quilt site! I would love this revolutionary new ruler-count me in! What could be better than cutting AND sharpening! I would like a 6 x 24 inch ruler with a sharpening edge because I just paid $38 for a power rotary blade sharpener and it doesn’t work! I am a senior citizen on social security income and I cannot afford that kind of investment for something that does not work. Pat – looks like a great idea. I’ve thought about what a good thing it would be if my ruler actually sharpened my blade! Thanks for a great ruler! I would love to own one of these rulers!! I have not been quilting that long and have a problem of cutting on my rulers. I have no idea how I keep doing this but I am sure with your ruler I will have an “edge” on cutting…no pun intended!! I would like to try one of your rulers because I go through so many blades with my Gingher rotary cutter. I thought the blades would stay sharp longer than the others because their scissors are great, but they don’t. It would be great to sharpen my blades while cutting! I also love that the lines for the divisions are below the actual lines. That will make squaring up half square triangle blocks easier. Thanks, Pat, for that great idea! As I get older, my eyes are not as sharp, and I really appreciate different color lines on the rulers. Easier to see, and easy to use!! I’m a ruler junkie. I always have to have the newest thing! I love the idea of the blade sharpener! 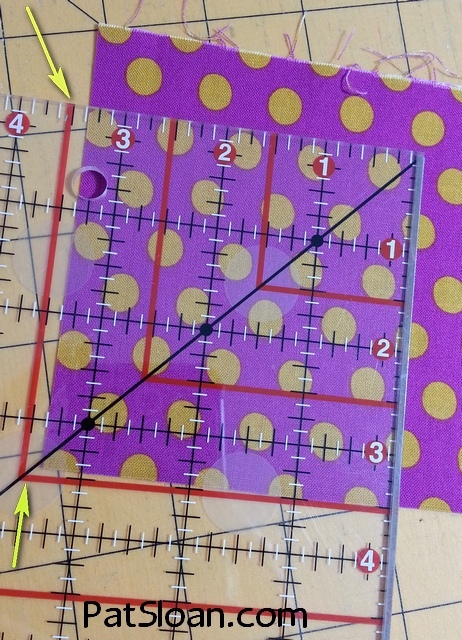 Why would I like to use these rulers…the 3 color system (it shows up so nicely), the grid, the binding reminder. The biggest decision is which one to try first. I like all of them but I’d definitely will have to buy the yard stick first. No more problems cutting fleece or home dec and squaring up the quilts will be a LOT easier. Great job!!!! And thanks for the giveaway. I would love to win a ruler that sharpens my rotary cutter because I am not always great at changing my blades. I also struggle with getting my longer cuts straight. I think it’s a great idea to sharpen your rotary cutter while using it to cut fabric…. thanks! The rulers look awesome! I like the markings and the idea of sharpening my rotary blade every time I cut. I would LOVE to try them! Thank you! What great rulers, can use a new one as I tend to cut the edge as I’m cutting. Would love to try them. Thanks for the giveaway. I would LOVE to win one of these rulers! I go through so many blades, the idea of sharpening them while I work just boggles my mind! Would love a ruler like this. Awesome. Looks great, good tools are so important. I would love this ruler. It’s easy to read and will also sharpen by blade at the same time. I’m ready to try something new! I would love to try this ruler. I love the markings and really love the self sharpening edge. Hopefully I can buy less blades-or at least use a sharp one all the time! How cool!! Thank you for the chance to win!! Would LOVE this ruler! My blades are always getting dull and I’m too lazy to change them. When I do I realize I really should sooner! 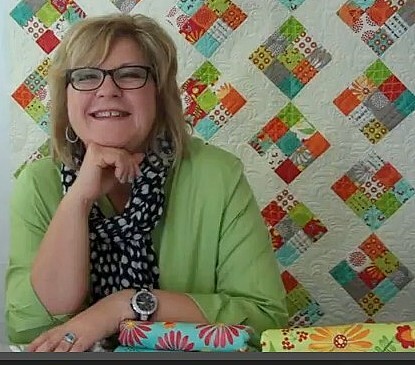 I am always game for trying a new quilting tool!!! and this seems like a great money saver!!! I would love to use one of these rulers. Having something to help blades last longer is a bonus! I need a new ruler and would love to try this!! Plus, my hubbie often helps cut and I think he would like this too. Pat, I love the three colour system you used for the measurements. I have cut the wrong size several times because my current ruler isn’t an EDGE RULER! Thanks for helping to creative such a wonderful tool! OOOh, sharpens as you cut? I NEED this – mostly because I seem to run out of blades when I need them and never seem to have them on hand! I would love to win the ruler! It would be so great to sharpen the blade as you’re cutting. And the red lines at the half inch marks are brilliant! I would love to have this new ruler I love anything that has to do with quilting. I looked at those rulers at the fabric store today and wished I had one would love to win. I love the color system, and the added bonus of a sharpener! The new rulers look great. I would love to give them a test drive. There is nothing finer than a good ruler and a sharp blade. Pat is a genius!! Hoping I win because I really like PAT SLOAN> I am the one who sent her the Seaside Rose basket. This is a great ruler. I like all of its features, especially the “tuck in” marking. It would be so much easier to line up the fabric along the red lines than using the thin, hard to see lines on the rulers I’m currently using. I love that you can square up blocks with these rulers. Very cool! 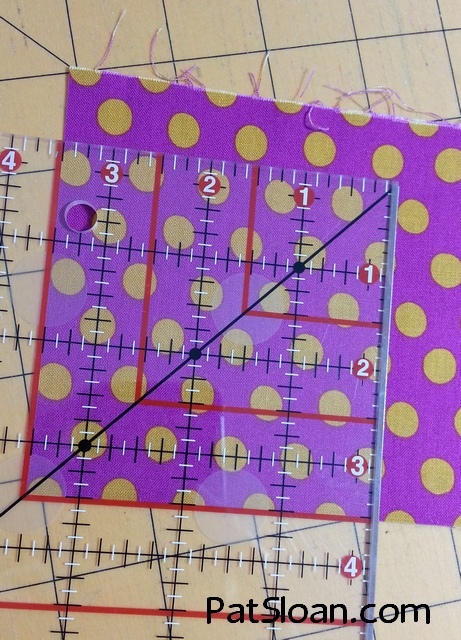 I am so glad that someone/Pat came up with this NEW ruler idea for us quilters, the cutting edge that sharpens and the different colors on the ruler that will make it much easier to see what a quilter can use, A VERY USEFUL TOOL so KUDO’S TO YOU PAT for helping in the making of this ruler! oh wow what a very unique ruler, love the idea that i can sharpen my blade while cutting – that makes cutting so much better! great job Pat. What a wonderful idea! I use so many blades.. it would so great to re-use a few. I hate that our world has become such a throw-a-way society, time to go back to old ways and reuse. Interesting concept and I like the different colors to track measurements. I am a visual learner, so I like the colors on these rulers! Nice degreed angle markings also! Nice variety of sizes too! I’m a visual learner, so LIKE the different colors marking these rulers! You have a nice variety of sizes! THANKS 4 a nice Giveway! Way to go, Pat. New rulers are always exciting. At first I figured there was no way you would convince me to consider your rulers as I am “married” to my favorite ruler with a no-skid surface. So imagine my delight when I hear yours has that essential feature as well. It’s so nice to see a ruler designed by someone who understands the needs of “seasoned” eyes. The added benefit of keeping a rottary blade sharp longer is simply the icing on the cake! Love your blog, and really feel this ruler would be handy for sharpening, and squaring up. I’m always ready to try something new. It’s a no brainer as to why I would love to win one of the Edge rulers. I’d always have a sharp rotary blade! What could be better? Wish me luck! Sounds like a really neat concept, and I’m always game for trying new rulers that can improve the job! It would be awesome to have one of these rulers in my collection. Would love to try out the rulers! Awesome!! I love the different colors and that the block is set inside the lines instead of under!!! Fabulous, I’d love one. The idea of sharpening the blade as you cut is wonderful. Pick me and I.ll share it with my friends. A project by Moda and Pat must be good. I would love to win a ruler and see how this innovation works. I can only imagine how cool this would be. What a great idea! Anything that prolongs your blade is great!!!! I would love to multitask with this ruler! I can sharpen my blade and cut accurate squares and lines all at the same time! AWESOME! I too like to try new products and the sharpening aspect is REALLY is great! Would love to win this and use it because it sharpens the blade as you cut! Thanks for the nice giveaway! These rulers are taking multi tasking to a whole new level, cutting and sharpening my blade at the same time. Would love to win one! I would love to use this ruler to help me have accurate cutting on my next quilt. They look so cool! Wow – so much time would be saved when cutting because the line markers are so clear. Plus you can sharpen while cutting. Great features! I would like to win one of these super awesome new rulers because I pretty much love everything about it! And to invent a ruler that actually sharpens your rotary blade instead of dulling it, well I would call that pure genius! I love that it sharpens but also the markings are greatness. Very clearly marked to square anything. What a great idea! I would love this ruler because it would mean less time buying or hunting for rotary blades and more time making “quilty” loveliness. I’d love to have this ruler! I love the clear markings and the blade sharpening! Wow, I just saw this new ruler and couldn’t believe it! How revolutionary. My blades will last soooo much longer, and with the price of replacements, that’s a good thing. So how about picking me to receive this fabulous ruler? I would love a ruler like this one! Sounds awesome!!! As I get older (how did that happen? ), I have a more difficult time seeing the ruler lines. Your color code system for the rulers is great, I know I would be able to cut accurately with these rulers. Wow these rulers sound terrific!! Leave it to the professionals to creat an awesome product!! Thanks!! Can’t wait to try one!! Or 2 or 3!! I am saving my nickels and dimes for one of these rulers! I am new to quilting and rotary cutting. I find I am always a little off on my squares. I think this will make the difference. And want this ruler more because I am so cheap. I am using a nicked blade because most if it cuts pretty well. SELF SHARPENING… Pretty Awsome! I have used these rulers when visiting my daughter….I love them! How great it would be to not have to manually sharpen blades or replace them. Anything to help me be more accurate! I love the three colors on the ruler, makes so much sense! I’m always on the lookout for a new tool or ruler. This one looks like one to try. blades can be expensive–any way to save on that is a game changer! I do love the coloured lines on this ruler–what a terrific idea! Wow, what great, easy to read rulers! With the high price of blades it would be great to have one of these rulers. Thanks for the giveaway. I’d like to win before I buy for my shop. It looks like a great ruler. I hate dull rotary blades, so this is such a promising idea! Thanks for the chance to win. to keep the blades sharp helps accuracy!! Thank you for your progressive ideas!! Wow, these are great new rulers! I love the unique grid system with the three colors to identify with. The “Set In” line system for squaring up the blocks and the non skid backing to help keep the ruler from slipping, I need all the help I can get. I would love to win one of these new rulers. Anything that makes the cutting process easier and incorporates the sharpening process into it has got to be a winner!! I would love to try this ruler! The biggest attraction is the blade-sharpening edge. I have actually damaged blades with the edge of my current rulers, by not paying as close attention as I should have and have ended up nicking the edge of the ruler which caused a bad spot on my blade. Plus, the cost of blades is pretty high, so having a built in sharpener would be a great way to extend the life of the blade and its value. Super great idea, Pat!! Would love one of these little baby’s in my collection to use!! I really don’t need a new ruler, but I do need one that sharpens as I cut…wow what a great idea! I always seem to have trouble squaring up my blocks. Face it, cutting is my most difficult thing to do. I have such trouble with accuracy. Have tried several different brands of rulers, and still problem persists. It would be nice to have my blade sharpened while I cut. Maybe I would get more practice in. Love the look. Would the sharpener still work if you flipped it over? That might work for lefties. I would really be interested in the markings…I tend to be very picky about my accuracy. Thanks for the opportunity! Wow!,, How Awesome is that !!! Love the markings on these rulers. I always worry about cutting exactly to measure, and what a bonus of sharpening the blades! Hope to win!!! Thanks. Would love to win one! Sharpens my blade and has easy to read markings? Count me IN! I would like to try the ruler to see if the blades actually last longer. It looks like a good idea if it works. This ruler looks awesome. I like the fact that it sharpens your blade while you are cutting fabric. I just love this, there is nothing more irritating than a dull rotary cutter. I work in a quilt shop and would LOVE to have one of these rulers to test out and convince the shop owner to purchase some! I would love to win one of these rulers! I guess lefties can just read the ruler upside down. We’re sort of used to that! Sharpening your blade while you cut saves time and should cut better. And the markings on the ruler should make it easier to cut too. Would like to try these features out!!! These rulers sound awesome! Would love the chance to win one and give it a try Thanks. WHAT A WELL PUT TOGETHER RULER! This looks like a fabulous ruler – love the idea of sharpening your cutter each time you use the ruler. And I love the clear markings for squaring up your blocks. I love the square up feature! Super easy! This ruler looks absolutely wonderful. With my failing eyesight, the 3 different colors would be very helpful! And saving money on rotary cutter blades is also a big PLUS! Hoping to win! I would love to have any of the rulers but the yard stick one would be wonderful. No more pushing 2 rulers together to cut longer fabric. I would love to try this new ruler. The fine lines are perfect; that has always been a prerequisite of mine. Thanks for the opportunity to win one. I would love to try this new ruler. It would be nice to find the 1/2, 1/4, and 1/8 inch markings easier! Love the 3 colour system and also the fact that it sharpens as you cut. Also squaring up looks so easy as well. The best part is the yard long one such a blessing when you are squaring up the quilts…would love to have this one!!!! What an awesome idea! Sharpen and cut at the same time! Wow, I’ve joked about this concept, but now to see a rotary cutter ruler, ROCKS! I love the color choices as well, and to have 3 different, well, that too ROCKS! I like the 3 color marking system. At my age, I need all the help I can get when cutting fabric. I have to admit, I don’t change my rotary blades as often as I should. It sounds like a great idea to sharpen them as you cut. Now this is absolutely awesome!! I live in a rural area, and it is 18 miles from the nearest place where I could get new blades and there is only 1 shop, but she closes at 6pm. If I had one of these rulers I wouldn’t have to worry about getting new blades as much, because they would stay sharper. I would ask why didn’t someone come up with this sooner, but I know the answer. This would not be good for the companies who make the blades, but really great for the company who makes the rulers….and totally awesome for those of us who would be lucky enough to own one of these!! I’m always changing blades and worried about disposing them, this is the perfect solution!!!! hanks for the opportunity in the giveaway. I would love to try this out. Those darn blades get expensive any way to save a little is a good thing 🙂 More to spend on FABRIC!!!! That is a great idea! Would love to win one. Thank you for the chance to win. I would love to try a ruler that also sharpens my blades at the same time. It makes sense to me to have your rotary cutter blade to be constantly sharpened. Not only will it cut better, it will be easier on the person doing the cutting. I would love to try them out. Great design for the grid too. The tri color design with placement areas would make EVERYTHING more accurate. Every minute counts and this would be very helpful. So glad to see that it is available. Well I would love to win this ruler! I am just learning to quilt and I do not have many rulers yet and don’t have anything like this! Why not learn on the best right? :-). It may make learning less frustrating. I love the clear and easy to read grid! Some rulers out there have way to many measurement on the grid and make them a little overwhelming to a newbie. Good idea! I keep forgetting to change the blade gets dull. Would love to try te blade sharpening feature! Since I use my cutter every day and go thru so many blades, this sounds like a great idea! Oh JoY!!! I would love this ruler because I am bad at sharpening or changing my blades so this would help me with that and because I would like to use it! Hehe…thank you! I would definitely love to try out this ruler. First the idea of a ruler that would sharpen my rotary cutter blade at the same time I am using it sounds amazing. Also I think having 3 different colors for the measurements is great and I also really like the “Set in” line system to help square up blocks. All around this looks like one of the best quilting rulers I have ever seen and I would love to try it out. I love the 3 color markings. absolut great!!! the idea of sharpening while you cut is GENIAL!!! i’ d love to have that!! I would love to win this ruler. I do the cutting for our church’s charity quilting group and to have a ruler that sharpens as I cut would be a dream. I’m really a ruler fanatic – and this one looks great! Would love to be able to try it out! Would love to try a ruler that sharpens my blade as I think this will really help in cutting strips. Thank you for the chance to win. Wow! A ruler with the markings we all want and blade-sharpening, too! What more could we ask. I’ll be looking for this for my sewing room right away. A ruler with a sharpener WOW!! What a concept!! I bet it also eliminates another problem with those plastic rulers, the nicking that happens. I will be on the lookout for these. Wow! I really love sewing gadgets and this ruler that sharpens the rotary blade as you cute…well now that is downright revolutionary! Thank you very much! and Congratulations!!! Great looking ruler. Love the color-coding. I’d like to have one because, obviously, the 12 rulers I have already are not nearly enough! This ruler will help save on those pesky “missed” cuts with a dull blade. Plus blades are expensive and I like the fact you might not have to purchase quite as often. have been sewer and quilter for many years but have only recently understood the benefit of having (and using) multiple rulers! Your design for Sullivans incorporates so many of the tasks that simplify our quilting and make for an accurate block! All this and it sharpens our rotary blade too! Fantastic design Pat! I can’t wait to have one. Awesome rulers! Love the quilt behind Pat’s picture as well–thanks for the details and the chance to win a great prize! I have to admit I would love to try this because I am tired of cutting into my ruler – sharpening it would be so much nicer. I’m a gadget girl and would love to try this. Thanks Pat and MODA. Interesting and neat ruler – would love to win this. Thanks. Wow! What a fabulous idea! It seems like such a waste to replace a blade when it has one little nick in it. This would really extend the life of those blades! I’ll be looking for them! wow , this looks like the best of the best in rulers. Love the 1/8″ markings and the three colors. The blade sharpener is a great plus. I’ll be looking for these at my local shops. Thanks for the giveaway! I’d like to give this a try because when I’m cutting up scrapes for dog beds to donate – I dull my blades to the extreme. This is a great ruler. Right size and the added feature of a cutter sharpener! I love the red line! Makes so much sense! And a built-in sharpener is icing on the cake! I’d like to try that out with cutting squares. I can be contacted through my blog at http://www.missourimel.com. Thanks! Pat, I’ve noticed that you have been in the quilting business for many years but don’t seem to look a day over 30! I can only assume that you started when you were 3 years old. I love the sharpening feature on the rulers and nearly hyperventilated when I saw that you don’t have to cover up the numbers when cutting on the cutting mats! Whoot, whoot!! I am constantly changing rotary blades…what a bonus to be able to sharpen as you cut! I especially like the 3 colors on the markings of tge ruler! With my eyesight I sometimes struggle! I love the idea that my blades would be sharpened with each cut and the three colors is a super idea. Wow, a ruler that sharpens your blade. I hope it doesn’t leave any metal particles in the fabric! Would love to check it out. Will have to ask my LQS about it. I am a ruler freak! So I just must try this out, especially if it sharpens my blade! I mean, come on who doesn’t love a sharp new blade? That’s like Heaven itself..
Ohh, I need one of these in my home!! Love the clear acrylic with the bright markings on top of the fact that it sharpens as you cut….what a way to save on blades…genius!! These rulers look wonderful. Thanks for the videos showing them. And, would love to own one. I love the idea of 3 different colors. It would make measuring so much easier. Also, to be able to sharpen your blade while you are cutting your fabric is awesome!! I would like it to sharpen my blades. I just hate throwing all those blades away. The sharpening edge would be great, but I’m interested in the different colored lines that would be a big help. Finally, a ruler that helps give perfect cut squares. Being able to sharpen your blade at the same time, a fabulous bonus! Thanks for allowing us the opportunity to win this wonderful ruler. I love the square up option of this ruler. I never know if I should be right on a line, right past it or right before it. I like the sharpening feature very much. And the different color marks are a great idea also. Thanks so much for thinking of all of us! Thanks for a fun giveaway. I would love to win this ruler especially if it sharpens my blade and keeps my cutter working happily for longer. This would be great! The markings look so much better than my current rulers. Thanks!! What an incredible innovation! I would love to have one of these rulers. Well, actually I would like to replace all my rulers with these. I love trying new techniques and new RULERS! And this one looks great! sizes. Some of my rulers need to be replaced and these would be perfect to fit that bill. What a great idea! What a concept! I am so cheap, I hate to change blades too often! Thought about ordering a blade sharpener, but this is really two tools in one. LOVE THE RED LINES…. Fantastic idea cut and sharpen at the same time. No more dull blades!! This is an awesome idea! I always get a dull spot on my rotary cutter and have to go over the cut 2 or 3 times to get it done. Great invention! I have been looking for one to try, but no one in town carries them and the shipping to order one is as much as the ruler in many cases. I would love to win one so I can try it. I have read about them several times in the past on Pat’s blog and on her chat pages, but cannot find one locally. Pat I think the markings are genius! I recently thought I need a new 6 1/2″ ruler this would make a great addition to my rulers! This appears to be a ruler that makes sense: lots of features (I especially like having it sharpen the blade without having to buy a new rotary cutter), easy to read lines to help me in cutting lengths and squaring up blocks. And all of this on ONE ruler! Thanks for all of the features! I would like to try this ruler and see if it really does keep my rotary blade sharp. What an awesome ruler! Looks so helpful! Wow! A ruler that sharpens too. What a great idea. The markings on the ruler makes measuring so much easier. Less time to measure and more time to sew and quilt. A winner any way you look at it. I have to get one. I use my rotary cutter so much I dull a lot of blades. This is my answer. I’ll have to look for mine as I have not used it. At least I do remember hearing about these rulers at my LQS. This ruler seems very versatile. Extremely clever. I was able to purchase a couple of these rulers already and would like to add some more!! They are great! This looks awesome. I HATE to change my rotary cutter. It never goes back to the way I originally got it. It feels like I go through the blades too much. Thanks for the chance to win! My sister has this ruler and cutting tool. She loves hers. So I know I need one too! That is fantastic. How wonderful to be able to sharpen your blade while cutting fabric! Must have. I think it would be cool to be sharpening your blade while I was cutting- there is nothing that is more annoying than trying to cut with a dull blade. Thanks for the chance to win one of these rulers. I like the idea of the tucked in red lines. Plus the sharpener! I would love to win the rulers, they are awesome. Imagine never having a dull blade! I am interested in anything I can do to improve my cutting accuracy. I would love to try these out, mainly because I love learning new and better ways in sewing and quilting. I would love to win and try this ruler out because I have NO specialty rulers….this would be great! I like the three different color line. It seems like it would make it a lot easier to locate the ones you want. I also like the idea of sharpening my rotary cutter blade when I cut, because I hang on to my blades as long as possible! What a great concept. What will they think of next. This would be a great help to all quilters. I would love one of these rulers! Seems like you’ve thought of everything! It seems like my rotary cutter blade is dull so I would love to try this ruler. What a bonus to sharpen your blade with every cut! Very nice ruler. Love the coloured lines and to sharpen your blade as you work would be great. Blades don’t last long enough as it is. It will be something I will have to check into. How great is that I sure would go thru less blades! I like the 3 colors and that they aren’t the bright neon colors like on so many rulers. With rotary blades being so expensive, anything to help them last longer is a huge plus! Thank goodness yall came up with a ruler I can SEE! And it sharpens your balde at the same time – Win!Win! I would love to try this ruler. Does it shorten the life of the blade, by sharpening so much? I am so excited for all these new tools that help so much! This one is awesome. What wonderful, helpful ideas all in one ruler. I always seem to need a sharper blade in my rotary cutter. My blades don’t seem to stay sharp very long so sharpening at the same time seems like a great idea! Goodness what innovation. I would love this ruler. Wow, lots of great features! Like a ruler on steroids. This is a genius idea! A ruler that sharpens your blade as you cut? Brilliant! My blades are always dull, would love trying the sharpener. What a handy device! As a broke college student with an expensive quilt hobby (hmm…maybe that’s why I’m broke? ), I hate having to buy new rotary blades when I could be spending that money on fabric! I also love the three-color scheme, how helpful! Great Idea. I love the idea of larger numbers, and sharpen my cutter too. For those of us with less than perfect vision, larger numbers are fantastic! I would like to try the ruler to see if my rotary blades would leave fewer nicks. And the markings look so much clearer. I’m horrible at changing my blades, this sounds amazing!! What a wonderful idea! I tend to dull my blades very quickly by nicking the plastic of my rules (still a newbie here, but I’m getting better) so this ruler would be a perfect addition to my tools!! Attractive, easy to read rulers and what a bonus if you can sharpen your blade at the same time. This ruler looks like it would be very user-friendly for this visually-impaired, old lady! Can’t wait to try it out! The sharpening edge is unique, but I am more interested in the red 1/2 mark lines. Very clear and easy to see as it seems a lot of things are cut at the half line. Genius. I would love to win this – it would save me money on blades!! I would LOVE one of these rulers! Mine need updating. Love the videos! Squaring up is always tricky so a ruler that makes it easy is tops in my book. Great idea to add a sharpener in there too! I’d love to win this ruler for two reasons. Who wouldn’t want to win a ruler that helps keep your rotary blade sharp all the time?! Hello! And two, the color grid you developed for the measurements is awesome! Way to go Pat. So maybe this little number will be on my cutting table soon?!! Thanks! How great would it be to have your cutter sharpen itself while you cut? Would love to add this ruler to my collection! I never have to sharpen my rulers again. WOW!!! I think this is just the coolest thing….sharpening while cutting….wow! Yes, I would like to try it out. I would really like one of these rulers and will have to find the 6.5 by 24.5 since my other 6 inch ruler just cracked(it was really old). I wonder do the blades wear down so they have to be replaced more often or do blades last longer because they stay sharp? I am a gadget person, I like to try new things. But I am also frugal so before I buy I want to know more. Thanks for your instructing, I appreciate your comments. I would love to try it, because I hate changing blades and they would last longer. Terrific giveaway, thanks for the chance to win!! That is the coolest ruler!!! I have a larger size of this ruler and love it. The 6 1/2″ would be great to add to my collection because I use so many 6″ units and squares. A ruler that keeps the rotary blade sharp is a great thing! No more dull blades? Color me there. I love that it’s self sharpening. Awesome! Looking forward to saving money by not buying rotary blades as often. Cool concept. What’s not to love about a ruler that will also sharpen my rotary blades?! This ruler would be fantastic to use. My blades always seem to need sharpening way sooner than I think so to be able to sharpen while cutting would be absolutely terrific!! What a great idea – love the sharpener, the 1/8″ marks (I need them all the time) and the red square up marks. Awesome! I need all the help I can get when it comes to cutting – my mind wanders and before I know it I’ve cut something wrong! I’d like to have one of the rulers because I’m constantly cutting, and constantly sending my blades off to be resharpened by a friend. This would really cut down on that. I also like the idea of WHERE to place the ruler to get the accurate cut. What a great idea to sharpen while you cut! and love the 1/2″ marking in red. Thanks Pat! I really admire a good tool, and this one looks amazing. Sharpen my blade as I cut? Thoughtful grids that make my squares more accurate? I love it all. I would love one of these rulers because they are clear and easy to read the measurements. I love the idea of sharpening with every cut! The rulers look awesome! I would LOVE to win one of these rulers!I’m a ruler junkie. cutting AND sharpening at the same time wow how great is that will have more money for fabric to buy hope i win! I love this ruler because of the bold red line for easy measuring of 1/2″ sized blocks! Plus being able to sharpen your blades with very cut is a true benefit! I go thru so many blades since I do so much cutting- would love to try this ruler! I would love to have a sharpening ruler. Seems like a great idea and great way to lengthen blade life. I had read about this ruler somewhere, and thought “What a great idea!” I’d love to win one. I’m surprised at how fast the blades on the rotary cutter need changing. I would love to win a ruler because I am so frustrated with my dull blades. Awesome idea to have a sharpener on the edge. I am lucky enough to have one of these rulers and it is awesome. Would love to win another one, but will be happy for anyone who does. The noise can be a little disconcerting, but when you think “it’s sharpening my blade” you’ll grow to love that noise and wish all of your rulers made it. Quilting is not cheap and in particular the rotary cutting blades. Any product that can save money is awesome. I love Pat Sloan and listen to her podcasts. If she promotes it – it must be a great product to have. Love the markings on the ruler, easy to read. Bonus to sharpen my blade as I cut, bravo! Great ruler, I like all the things about it. Thanks for the giveaway. I have a stack of old blades that could be put to good use again! Don’t know why I never throw them out… maybe I was waiting for this! I love the idea of sharpening your blade as you use it. Using three colors is also a great idea. Could it really be true? To always have a sharp cutting edge? Count me in – I would love a chance to try this out! I like the color coded grid system. Thanks for the chance to win. Wow!! Your ruler is awesome!! Finally a ruler that allows perfect precision when cutting with easy to see lines and it has a bonus edge for keeping the blades at top, sharp performance!! This is defintely a must have! Because my rotary cutters would never have a dull edge. I love the fact that it sharpens the blade, The measurements are awesome too. I love rulers of all shapes and sizes and of course a nice sharp rotary blade to go with them. These rulers are such a great idea, and I’d love to try them! My rulers get a work out, so I know my cutters do too. Would be great to sharpen while I cut. The markings look clear and easy to use and I love the whole sharpener idea! brilliant! Thanks.